Easton Bell Sports is 80 years into the sports technology business with Easton Hockey around for the about the last 20. I follow Easton Hockey at Twitter here. Easton Hockey equipment includes: sticks, skates, helmets, gloves, protective gear, pants, apparel, bags and accessories. Easton Bell shares across all brands and divisions. Constant R & D at their Helmet Technology Center done by top engineers along with and the best players input helps give Easton Bell products consistent technological advancements. Easton Hockey leads by example. They’ve created the most technically advanced helmet ever made for hockey, the S19 Z-Shock. It’s stiffer and lighter than the S17 while offering better performance and safety. A better fitting helmet is a more protective helmet, no question about it. I played lacrosse for a few decades and can attest to the disadvantages older helmet technology presented to players. Helmets did not fit as well, the line of sight was bad and they offered less protection. Antimicrobacterial technological advancements alone in the S19 are priceless to everyone’s nose! The S19 has a more sleek profile and is the slimmest helmet, temple to temple, on the market. The result is a profile that is narrower so you can see more of the ice. The Stealth Hockey helmet design offers maximum protection, high-performance, superior fit and is ultra light weight. Just 325 grams of weight offers 220 lb of pressure protection. FormulaPR mailed Sports Techie the S19 helmet to review and much to my surprise, there was a promotional item inside the package, an empty 12 0z cup of a Seattle brand of coffee that when full, weighs more than the new helmet! The game changes now. A YouTube S19 review by icehockeywarehouse is here. The official Easton Hockey S19 press release is here. – Acu-Snap fit system that tightens in seconds. 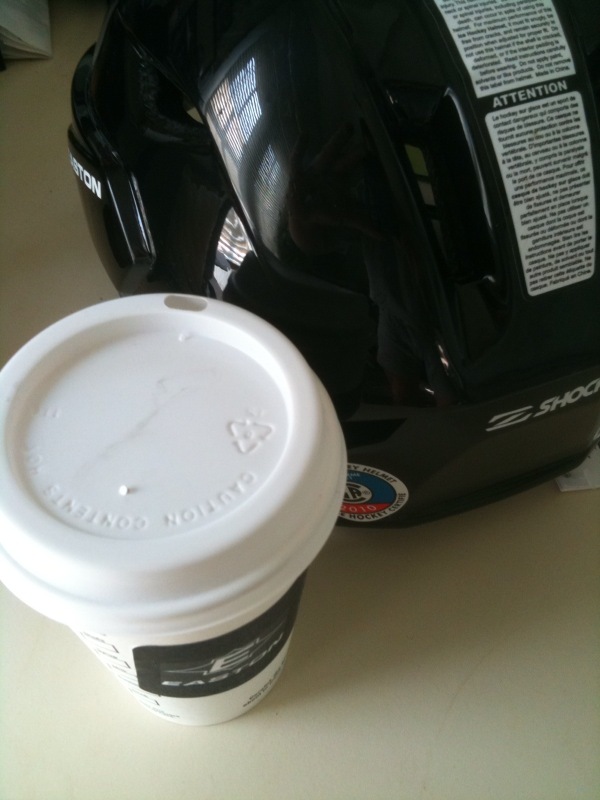 Players like the NHL’s Taylor Hall, Zach Parise and Olympian Natalie Darwitz http://eastonhockey.com/members/ndarwitz wear this helmet simply because it fits better, weighs less and causes less fatigue. The S19 exceeds industry impact requirements. Impact absorption threshold testing data rates high for the S19. The Hockey Equipment Certification Council http://www.hecc.net/about.html conducts CSA/HECC/CE helmet testing. HECC certified equipment is required by USA Hockey, the National Federation of State High School Associations (NFHS), and NCAA (facemasks only). The S19 helmet I reviewed has a born on date that tells you when the HECC certification is no longer valid, in this case it clearly expires on 08-2016. Head injury expert Kim Gorgens, a neuropsychologist at the University of Denver (DU), says that most concussions deliver 95 g’s to the human body upon impact. G-force is a unit of force equal to the force exerted by gravity. In addition, the average football player receives 103 g’swhen hit during a game. In comparison, the average g-force experienced by military fighter pilots is nine g’s. All sports players have a hard time passing any mirror test after concussions happen. Link and info by Medical News Today. My Easton offers profiles for fans, players, coaches and dealers. Any member can upload pictures and videos, join groups and team pages or talk about your fave gear. There is an easy to use My Easton Facebook Connect link available. New Eaton hockey apparel for 2011 is performance drive wear designed for the hockey athlete with Bio-Dri fabrics, compression and fluid mobility. Synergy EQ5 skates are new and feature heat form-able uppers and a framework of composite reinforcements. Be sure to check out the Easton Pro Camps info, Juniors programs and the USA Hockey relationship plus more sports technology focused content at their web site and other social media outlets. Competition includes the Bauer 9500, Reebok 8k and the Cascade M11. Find your Easton Hockey Dealer using the locator here. Big shout out to Matt Kovacs who is here, he’s the Vice President of Sports and Entertainment at Formula PR. Thanks to Jack Follman too. Appreciate the opportunity to talk with you two and review the S19 Z-Shock Easton Hockey helmet. The next Sports Techie blog is an exclusive interview with New Orleans Saints General Manager talking about Sports Technology. See ya when I see ya, Sports Techie!